First Paragraph: The prospect of talking face-to-face with Sirius was all that sustained Harry over the next fortnight, the only bright spot on a horizon that had never looked darker. The shock of finding himself school champion had worn off slightly now, and the fear of what was facing him had started to sink in. The first task was drawing steadily nearer; he felt as though it were crouching ahead of him like some horrific monster, barring his path. He had never suffered nerves like these; they were way beyond anything he had experienced before a Quidditch match, not even his last one against Slytherin, which had decided who would win the Quidditch Cup. Harry was finding it hard to think about the future at all; he felt as though his whole life had been leading up to, and would finish with, the first task. . .
Hi there, Esteemed Reader. I've taken up a new hobby: reading books to Mrs. Ninja's stomach:) Our little ninja seems to enjoy it and that makes me proud. "I'm not born yet" is no excuse for not reading:) So far the little ninja has enjoyed the work of Hugh Howey and J.K. Rowling, but he or she has only had ears for about a week. But as it's Wednesday, Book Club Day, this blog is going to be strictly about Harry Potter today. The thing about one chapter a week is we don't always get to discuss a full part of the story. After all, chapters are the building blocks of a book. Chapter 19 wouldn't work on it's own and Harry Potter and the Goblet of Fire wouldn't work without it. Chapter 19 is largely about setting up the events of Chapter 20, which is for me one of the high points of the book as it's the chapter in which Harry finally fights a dragon--from the day Rowling started a seven-book series about a boy wizard in a fantastical world containing dragons, this fight has been inevitable. But Chapter 20 doesn't work without Chapter 19 setting the stage, which we'll talk more about in a moment. First, I just want to point out how much delight Rowling takes in making Harry's life truly miserable. In her way, she's as bad as Mad-Eye Moody turning kids into ferrets and bouncing them about. She's already given Harry the stress of having to compete in the Triwizard Tournament, but that's necessary for the plot to progress. Then Rowling had Ron abandon Harry and she had most of the school turn on him, thinking he placed his name in the Goblet of Fire for personal glory. Many of the students are now wearing badges reading "Potter Stinks." In the meantime, life became even worse for Harry within the confines of the castle, for Rita Skeeter had published her piece about the Triwizard Tournament, and it had turned out to be not so much a report on the tournament as a highly colored life story of Harry. Rita Skeeter had reported him saying an awful lot of things that he couldn’t remember ever saying in his life, let alone in that broom cupboard. It was Cho. Harry felt the color rising in his face. “Oh — right — sorry,” he muttered, taking the quill back. If I were to write an outline of this story, which would surely be less time-consuming than these weekly chapter breakdowns, I would write this for Chapter 19: Harry deals with the fall out from Rita Skeeter's article, Hagrid shows Harry the dragons he'll have to face in the first task of the tournament, and Sirius has a forbidden fireside chat with Harry about necessary exposition to further the mystery of who put his name in the Goblet of Fire. Hermione was furious with the pair of them; she went from one to the other, trying to force them to talk to each other, but Harry was adamant: He would talk to Ron again only if Ron admitted that Harry hadn’t put his name in the Goblet of Fire and apologized for calling him a liar. But this was a downright lie. Harry liked Hermione very much, but she just wasn’t the same as Ron. There was much less laughter and a lot more hanging around in the library when Hermione was your best friend. Viktor Krum was in the library an awful lot too, and Harry wondered what he was up to. Was he studying, or was he looking for things to help him through the first task? Hermione often complained about Krum being there — not that he ever bothered them — but because groups of giggling girls often turned up to spy on him from behind bookshelves, and Hermione found the noise distracting. “Wronski Feint,” said Harry, through gritted teeth. Quite apart from liking to get Quidditch terms correct, it caused him another pang to imagine Ron’s expression if he could have heard Hermione talking about Wonky-Faints. That may be the best passage about a teen missing a friend I've ever read. Who hasn't been in a situation where you wish a particular friend was there to appreciate the moment? And those moments are bittersweet if for some reason the friend can't be there. Because Rowling takes the time to illustrate Harry's loss, we care that he gets his friend back. By further illustrating the boys importance to Hermione, we care that they mend their friendship for her sake. 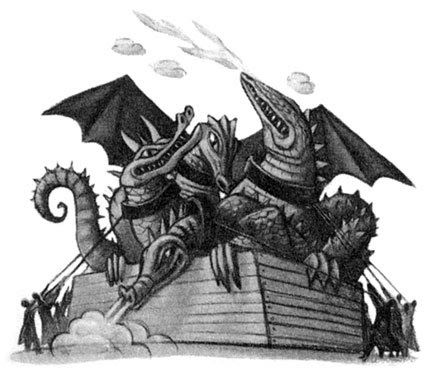 Four fully grown, enormous, vicious-looking dragons were rearing onto their hind legs inside an enclosure fenced with thick planks of wood, roaring and snorting — torrents of fire were shooting into the dark sky from their open, fanged mouths, fifty feet above the ground on their outstretched necks. There was a silvery-blue one with long, pointed horns, snapping and snarling at the wizards on the ground; a smooth-scaled green one, which was writhing and stamping with all its might; a red one with an odd fringe of fine gold spikes around its face, which was shooting mushroom-shaped fire clouds into the air; and a gigantic black one, more lizard-like than the others, which was nearest to them. At least thirty wizards, seven or eight to each dragon, were attempting to control them, pulling on the chains connected to heavy leather straps around their necks and legs. I especially love the detail about seven or eight wizards to each dragon. If each dragon takes that many wizards to control, what hope does one plucky boy wizard have? The dragons are well described, of course, and their presence is exciting, but my question for you, Esteemed Reader, is why are the dragons introduced in Chapter 19 rather than 20? Surely they'll be plenty of time to describe the dragons when Harry is fighting one during the Triwizard Tournament. It seems this book could be shorter if Rowling simply introduced the dragons the day of rather than a whole chapter before hand. Anticipation is half of suspense, Esteemed Reader.Harry fighting the dragon is one of the biggest moments in book four and Rowling builds to it by telling the reader in advance some of what's coming. Because both Harry and the reader know what's coming, the tension that mounts prior to Harry's brush with the Hungarian Hortail is in some ways more suspenseful than the actual tournament event. Charlie pointed toward the Horntail’s tail, and Harry saw long, bronze-colored spikes protruding along it every few inches. Five of Charlie’s fellow keepers staggered up to the Horntail at that moment, carrying a clutch of huge granite-gray eggs between them in a blanket. They placed them carefully at the Horntail’s side. Hagrid let out a moan of longing. “I’ve got them counted, Hagrid,” said Charlie sternly. Most every Stephen King book I've ever read had about 50 pages of character development and foreshadowing for every 5 pages of actual violence and horror, and he's the master of suspense. The secret to building suspense, as Rowling well knows, is not in keeping things from the reader, but in revealing things to the reader. If she told us nothing about the first task in the tournament, we wouldn't know what to expect and how excited to be until the second task. But because she prepares us a chapter in advance by revealing the dragons, we go into Chapter 20 excited and nervous for Harry. Last Paragraph(s): “Just thought you’d come nosing around, did you?” Harry shouted. He knew that Ron had no idea what he’d walked in on, knew he hadn’t done it on purpose, but he didn’t care — at this moment he hated everything about Ron, right down to the several inches of bare ankle showing beneath his pajama trousers. He strode across the room toward the stairs; he half expected Ron to stop him, he would even have liked Ron to throw a punch at him, but Ron just stood there in his too-small pajamas, and Harry, having stormed upstairs, lay awake in bed fuming for a long time afterward and didn’t hear him come up to bed. I find that chapters that connect plot developments to, or set up for, some big event are always the hardest to write!